When Cuthbert was a boy in Northumbria he didn't have a father (since his father had died when Cuthbert was very young) but he did have many friends to spend countless hours with in the countryside. As was and is the case with boys of that age, they spent much of their time competing against each other in games and silly contests. They had footraces and wrestling matches. They goaded each other into doing foolish and silly things. In short, they did the things that boys do in their youth and tell increasingly fantastical stories of for the rest of their lives. One day, however, a boy barely old enough to be out with them and nowhere near old enough to compete or keep up with them approached the boys as Cuthbert held one of his friends down on the ground. The group of boys were excited to watch the wrestling match and were not surprised to see Cuthbert win since he was the best wrestler and most athletic among them. The boy--barely older than a toddler--started crying as he watched Cuthbert wrestle. The other boys were shocked--and to be honest a little embarrassed--at the little one's tears. The boy said, "Cuthbert, stop being so silly and quit goofing around like this." The crowd of boys jeered and laughed at him hoping that this would convince the little one to leave but he continued weeping. Cuthbert's soft heart was stung by this and so he took the boy to the side and tried to soothe him. The boy said, "Cuthbert, showing off like that isn't right for a holy bishop and priest like yourself." As Cuthbert walked home that night, he reflected on the boy's words and wondered if there was a hint of prophecy in them--was he really destined to be a priest and bishop? Many years later, he was shepherding the flocks of his employer at night. It was the 31st day of August in the year 651 and Cuthbert was resting beneath a tree and looking up at the starry sky in wonder. Again his mind was drifting to questions of "calling" and "destiny" as his colleagues and friends told jokes and stories nearby under another tree. Suddenly, Cuthbert was amazed to see a bright orb descend to earth with piercing clarity. A moment later it rose more slowly while seeming to accompany another flaming orb back to the heavens before disappearing. Immediately, Cuthbert's mind went to angelic visitation and the faith that his widowed mother had given to him. He rushed to ask his friends if they had seen it. He insisted that some great man or woman must have just died and their soul was taken up to heaven by one of God's angels. When he entered the town the next day he asked around and found out that the revered Aidan of Lindisfarne had passed the night before and immediately Cuthbert knew what he had seen--the retrieval of the soul of Aidan. He dropped his shepherd's crook and went to a nearby monastery. Soon thereafter he took vows and became a monk. As Cuthbert served in the Church he became known for being gentle and hospitable even in the face of strong opposition. When the Synod of Whitby finally concluded that the Celtic churches must come into agreement with the Roman way of things it was Cuthbert that helped broker reconciliation by insisting that unity was more important than marginal disagreement. 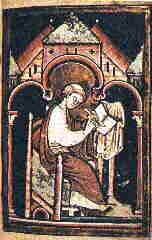 Through hospitality and furious love, Cuthbert was able to mend the wounds of the Church. Eventually, he became prior of his monastery and he served the Church well by taking care of the monks that he had been entrusted with. At one point he even became a hermit. He lived on an island by himself but was rarely alone due to the constant stream of visitors who came to seek his counsel, blessing, or healing prayers. Cuthbert accepted his visitors with a kind and welcoming heart even as he hoped for a little solitude in which he might worship the God who had called him from a young age to be a servant. Finally, he was called from his island to become bishop and serve the Church by overseeing its monks and ministers. He was reluctant but willing to accept this calling and served in the position capably for many years. At the end of his life a group of monks were sent to the island where he was living to take care of him in his final days. Having known that they were coming, the severely ill Cuthbert had dragged himself down to the beach to greet the men. When asked why he had come so far to greet them he had insisted that he wanted to save them the time and hassle of searching him out since they had never before visited Cuthbert's little island. He finally died after being bishop--a ministry he had been called to from his youth--for only two years. In those years he distributed alms, prayed for the sick and worked many wonders in the surrounding countryside of Lindisfarne. He died on the 20th day of March in the year 687.